When Cambodia joined the Association of Southeast Asian Nations (ASEAN) in 1999, the Royal Government of Cambodia (Government) faced seemingly insurmountable obstacles of social, institutional, economic, and political nature. From the economic point of view, the country is confronted with fundamental deficits. Cambodia is a small country with a relatively small but fast growing population, a large proportion of which is impoverished. Economic reintegration has been an important objective of the government in term of its growth vision for the country. For both political and economic reasons, Cambodia joining the World Trade Organization (WTO) in 2004 was a defining moment. With its ASEAN and WTO membership secured, Cambodia could finally claim its rightful place in the worldwide family of trading nations. From the outset, Cambodia has made its position clear that it looked to the ASEAN Economic Community (AEC) as a positive externality to stimulate and make irreversible substantial economic liberalization and more comprehensive and broadly based reforms. This clear policy direction was translated into visible political commitment and has enabled Cambodia to move rapidly in its institutional reform and economic development process. Successful reforms have led to significant improvements in the services markets themselves in terms of prices, quality, product variety, and the availability of new products. More efficient provision of telecommunications, banking, and other ICT related services have also advanced the digital integration of the economy with that of ASEAN. As a regional grouping, ASEAN is perceived as a wellspring of opportunity for high tech companies because of growth in the region’s digital economy coupled with a growing middle-class base and its young and tech-savvy population. To ASEAN policy makers, technology is a great leveler and the digital economy plays a strategic role as a critical enabler for deepening regional integration and as well as helping drive next-generation domestic demand led growth for startups and SME’s. The launch of ‘ASEAN ICT Masterplan 2015’ is a reflection of such belief that ICT is a key enabler for ASEAN’s social and economic integration. As a latecomer to the digital economy, Cambodia faces strong competition from far superior rivals as close as neighboring Thailand and Viet Nam. Cambodia’s e-commerce and fintech scene is more nascent and lags behind most other markets in Southeast Asia, but this is changing fast. The momentum for catch up is felt rapidly in the sector. Cambodia, which was once a country synonymous with conflict and poverty, now boasts more than two decades of impressive growth. In 2015, the country attained lower-middle- income status. With this comes a growing middle class whose spending power and consumer behaviors give rise to a need for new solutions in payments, credit, and mobile technology. As a latecomer to the digital economy, Cambodia faces strong competition from far superior rivals as close as neighboring Thailand and Viet Nam. Cambodia’s e-commerce and fintech scene is more nascent and lags behind most other markets in Southeast Asia, but this is changing. Policy wise, in its National Strategic Development Plan (NSDP) 2014-2018, the Government set out a clear economic diversification policy agenda focused on developing the backbone information and telecommunication technology sector. Sharing the vision of the ASEAN Masterplan, the Government adopted its Cambodian ICT Masterplan 2020 driven by four strategic thrusts to harness the benefits of the so-called Fourth Industrial Revolution: (i) Empowering people by way of human resource development and e-Awareness; (ii) Ensuring Connectivity encompassing national ICT infrastructure, legal framework and cyber security; (iii) Enhancing capabilities in the ICT industry, ICT standards, and research and development; and (iv) Enriching e-Services covering e-Government services, e-Public services, e-Economy services and e-Education services. In term of infrastructure to support its digital economy, Cambodia has witnessed a swift transformation driven by the injection of new technological advancement, similar to other advanced ASEAN countries. 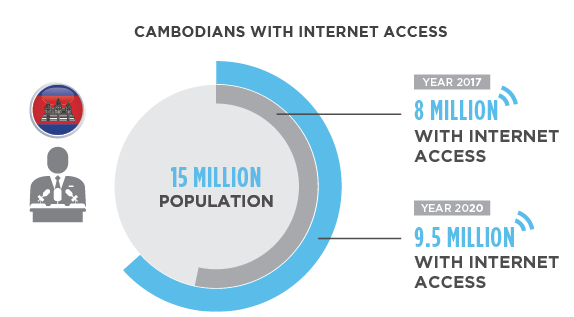 Rapid improvements in Internet accessibility and affordability, expansion of wireless networks and widespread usage of smart phones, absorption of advance technology among youths are all determining factors explaining Cambodia’s fast catching up in the regional digital economy. According to the Ministry of Posts and Telecommunications, approximately 8 million out of the country’s 15 million people have access to the Internet [in 2017] and it expects that number to reach 9.5 million by 2020, out of which 100 percent of the urban dwellers and 80 percent of the rural dwellers would have access to the Internet. In term of mobile telephony, 4G coverage across the country is impressive and provides opportunities for new industries like mobile commerce, on-demand services and fintech to thrive. The rate of mobile penetration is extremely high — estimated at between 90 to 130 percent, with notably, some 50 percent of phone users using smartphones. According to a recent survey, 48 percent of the respondents stated they have used Facebook while 37 percent of Cambodians indicated that they used Facebook on their own phone. Facebook is the number one news source in Cambodia, having surpassed television and printed media. [In 2017], the Malaysia-Cambodia- Thailand (MCT) Submarine Cable System and Landing Station was launched in Cambodia and Telecom Cambodia inaugurated its Greater Mekong Telecom Backbone Network project, which included the installation of a 467km fibre-optic cable connection between Sihanoukville and Kampong Cham. Cambodia’s mobile telecommunications company Smart Axiata, in partnership with global ICT solutions provider Huawei, also launched the 4.5G network in Cambodia, marking the beginning of a new era of improved and secured internet connection capable of providing an Internet speed 8 times higher than that of 4G. This latest evolution of mobile technology will enable subscribers to enjoy better and faster mobile internet, which is indeed an important tool in developing a digital economy. Industry experts expect the first commercial launch of full-fledged 5G to happen in 2020. Moreover, Axiata has recently partnered with Mitsui to offer enhanced digital services and Internet-of-things that would leapfrog Cambodia’s digital economy. Cambodia, no different than other ASEAN nations, is embracing the Digital Economy to advance its development agenda. [In] May 2017, speaking at the opening ceremony of the World Economic Forum on ASEAN, Cambodian Prime Minister Samdech Akka Moha Sena Padei Techo Hun Sen emphasized the need for ASEAN to ensure that its growth vision and agenda be responsive to the new context of a rapidly changing world, especially the strong momentum generated by the so-called Fourth Industrial Revolution, which creates a new growth dynamism characterised by dependence on advanced technology and markets. Already, Cambodia has made the necessary shift towards innovation and solution development in its efforts to contribute to the highly competitive digital economy of ASEAN in the decades to come. Dr. Sok is a practicing attorney and the Managing Partner at SokSiphana&associates/a Member of Zicolaw. He was appointed as Advisor of the Royal Government of Cambodia with rank of Minister in 2009. Since 2011, he has also served as the Chairman of the Board of Cambodia Development Resource Institute (CDRI).